As I sit here composing this blog post, I am, rather hypocritically, eating a non-gluten-free slice of pizza. And although I was diagnosed with a low-level wheat allergy as a child, I have never been instructed to follow a gluten-free diet, and I don't suffer from celiac disease or any other condition that would necessitate a gluten-free diet, at least as far as I know. Yet I can feel my stomach puffing up slightly, causing mild discomfort, as I consume my early dinner. Weirdly, both Sonia and I experience this phenomenon when we eat glutenful grains and traditional wheat-based products. Not so when we eat gluten-free. So why don't we eat gluten-free all the time, you ask—aside from the need to review glutentastic products every once in a while? Habit, mostly. Cost is also a factor. You can buy traditional whole wheat bread for just over a buck, but this loaf of gluten-free goodness, for example, will run you about $4.50. It won't break the bank, but unless it's absolutely necessary, it's hard for me to justify spending four and a half times as much for essentially the same product. But to be fair, it's NOT the same product—particularly for those of you who eat gluten-free out of absolute necessity. I'm sure for you guys, a couple of bucks is a small price to pay to enjoy sliced sandwich bread—something the rest of us take for granted each and every day. 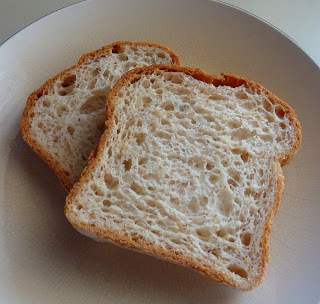 And I would say this gluten-free bread is the closest we've had to actual wheat-based white sandwich bread to date. Both look similar, toast well, and make great sandwiches. Taste-wise, I think I actually prefer this gluten free bread. It has a great nutty essence about it that you won't get from cheap old Sunbeam or what have you—toasting it brings out this nuttiness even more. It's somewhat similar to a multigrain artisan bread in terms of flavor, but not quite as complex. Texture-wise, it's definitely stiffer than traditional white sandwich bread, but not at all unpleasant. 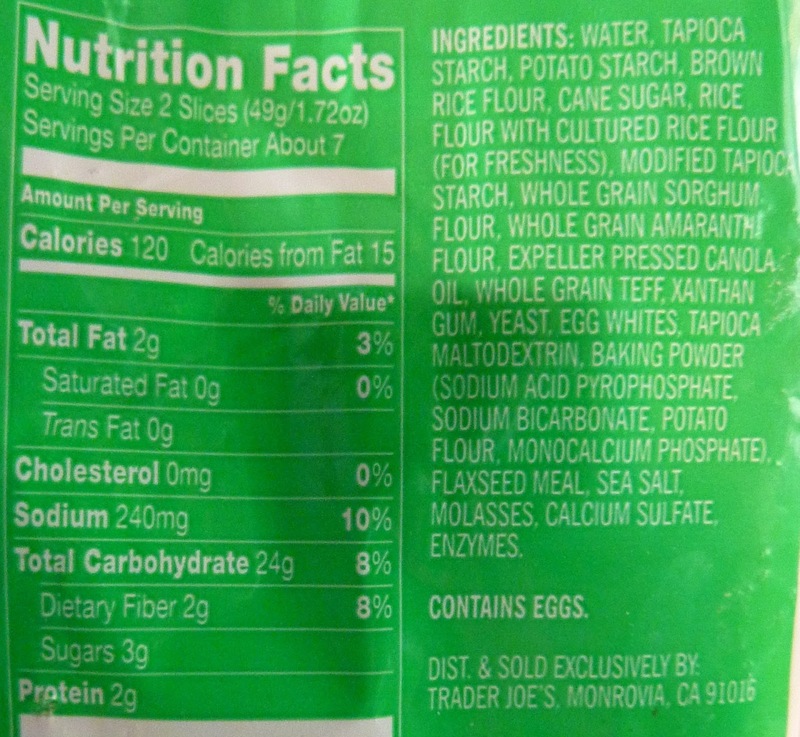 Sonia states that it's "fluffier" than millet bread or brown rice bread, which in her opinion, makes this product superior. I'll admit that the texture of this bread is closer to that of traditional bread, but I've always enjoyed the thickness and firmness of millet and brown rice toast. This bread is great for making sandwiches, with butter and fruit spread, or even just by itself. We've got no major complaints about the taste or texture, and we love eating stuff that doesn't make us feel all bloated and weird. I'm sure celiac, IBD, and Crohn's sufferers have their favorite stand-by sandwich breads already—like Udi's and such. For all I know, this may be a repackaging of some third party's brand that many of you have already tried. 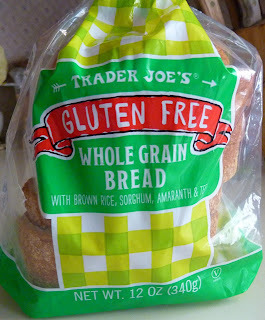 But if you're on a gluten-free diet and shopping at TJ's, Sonia and I both think this bread is worth a whirl. 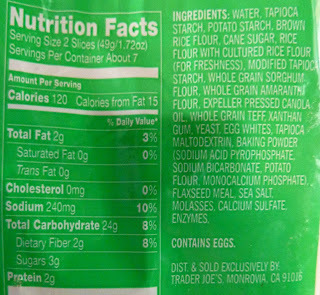 As the back of the packaging points out, the best thing since sliced bread...is gluten free sliced bread. Four stars a piece. Due to skin issues and a variety of other health concerns, I've been prescribed a gluten free diet. When my naturopath suggested this change in diet I nearly cried. I truly enjoy my carbs. I slowly added gluten free subs into my diet week by week; specifically straying away from the bread aisle. I was deathly afraid of biting into a slice of saw dust. Last week my hubby and I decided to go for it...and tried this bread first. Needless to say..I have to agree that this bread is better than just "not that bad" it's pretty darn good!!!!! OMG this bread is AWESOME and I don't even have to be gluten free. I picked it because 2 slices are 120 cals and it's perfect toasted. Love it! Podcast Episode 1: Introducing Let's Talk TJ's!